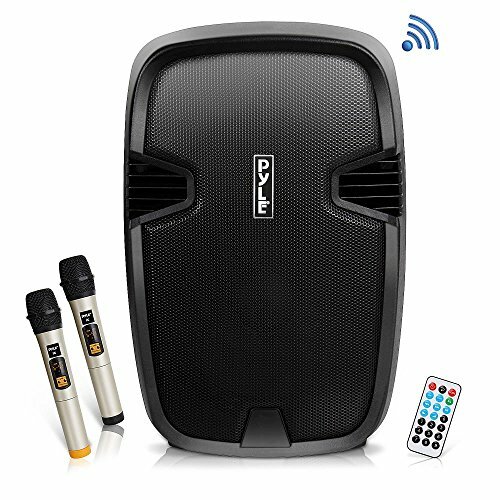 POWERFUL AND PORTABLE: This Compact and High Powered 1000 Watt Karaoke PA Sound System by Pyle is equipped with 12 inch Subwoofer and 1.34'' Tweeter for Full Range Stereo Sound Reproduction and its handles and wheels make travel easy. BLUETOOTH WIRELESS STREAMING: This Indoor / Outdoor Speaker System has a built-in Bluetooth with Wireless Range of up to 30 + Ft. So you can play music or song from your favorite devices like iPhone, Android mobile phone, iPad, Tablet, PC. AUDIO CONFIGURATION AND RECORDING: This Amplifier Speaker and Mic Set can Record Audio as streamed through the speaker or via the included external microphone. It also has Volume, Bass, and Treble Controls. Perfect for Dj, patio party, crowd control. USB / SD READER AND FM RADIO: The speaker is also equipped with USB / SD Card Readers that supports MP3, WMA audio files and it also has a built in FM Radio with Automatic Station Recognition so you can listen to your favorite radio station. RECHARGEABLE BATTERY: This box type battery powered heavy duty portable PA Loud speaker has a built in rechargeable battery which makes it convenient and portable. It also has a 35mm Stand Mount and 12 Volt Power Inlet for Car / RV Use. Ideal for personal or commercial use.